Regular readers of Chips & Crisps reviews will be aware that our Pringles reviews are largely the same. Certainly with the Texture and Crunch categories. They all look and crunch similarly. These snacks are very easy to describe. They are famously saddle shaped. The surface was bumpy but smooth. The colour was a very pale yellow that, if it were paint, would be described as 'White, with a hint of yellow.' There was also a lot of pale powdery seasoning. There may even have been the odd green fleck here and there. A Nose Plunge Test revealed a slight Onion aroma. The taste was similar, and perhaps one of the more accurate of Pringles flavours, given the variety description. There was most certainly a creamy Onion flavour, which was balanced by the familiar Pringles warm potato flavouring in the background. 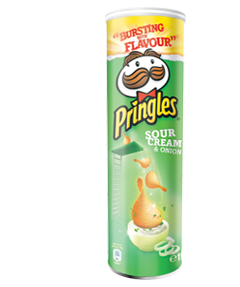 Again, like other Pringles varieties, they were relatively high in saturated fat and had a moreish moisture removing quality - we wanted to go back for more, but continuously got thirsty throughout the process.